Once again we had a wonderful day with nearly 40 people attending, all either a Greathead by birth, marriage or descended from a Greathead. It mattered not, all that mattered was they were there and they were all interested in the surname of Greathead. I was delighted to meet many people with whom I had communicated by email over the years and some who attended three years ago. It was great to see cousins who had not met for several years exchanging news. 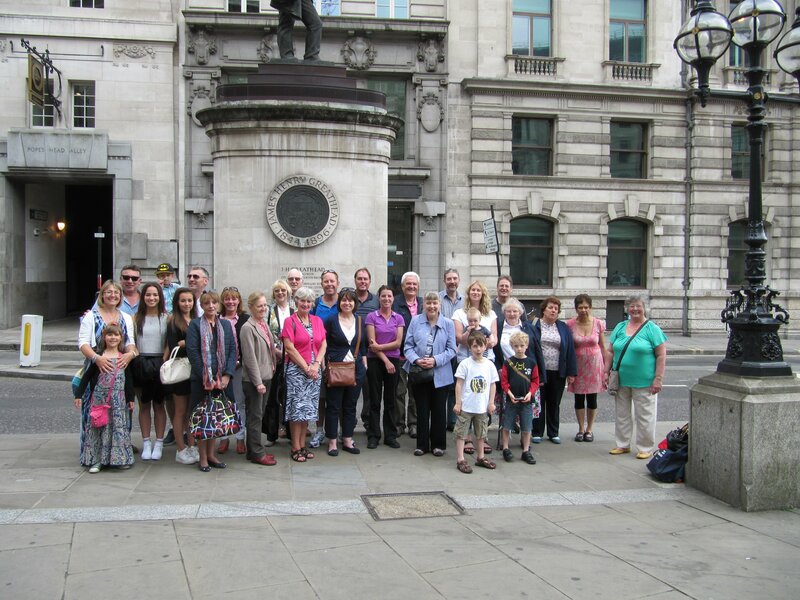 As three years ago we met under James Henry Greathead's statue by the Bank Underground station at 12:00 noon, we planned a group photograph and then to go to a nearby Weatherspoon pub for some food, drink and a chat. I once again handed out individual charts to each attendee and rolled out several quite large charts across the pub floor, much to the astonishment to many. It was fun to see people on their knees finding themselves and adding extra data. Some brought pictures that I scanned, they will be included on the website. Many thanks to all those who attended “YOU” made it a great day, we'll do it again some time!! !